This is a Saturnalia tree. In the 4th century CE, Saturnalia was a festival in which the Romans commemorated the dedication of the temple of the god Saturn. Christian leaders named Saturnalia’s concluding day, December 25th, to be Jesus’ birthday. 4 they deck it with silver and gold. They fix it with hammer and nails, so that it won't move. 14 He goes to chop down cedars; he takes an evergreen and an oak; he especially tends one tree in the forest, plants a pine for the rain to nourish. 15 In time, when it's ready for use as fuel, he takes some of it to keep himself warm and burns some more to bake bread. Then he makes a god and worships it, carves it into an idol and falls down before it. Roman pagans first introduced the holiday of Saturnalia, a week long period of lawlessness celebrated between December 17-25. Saturnalia was an ancient Roman festival in honor of the deity, Saturn. The holiday was celebrated with a sacrifice at the Temple of Saturn. 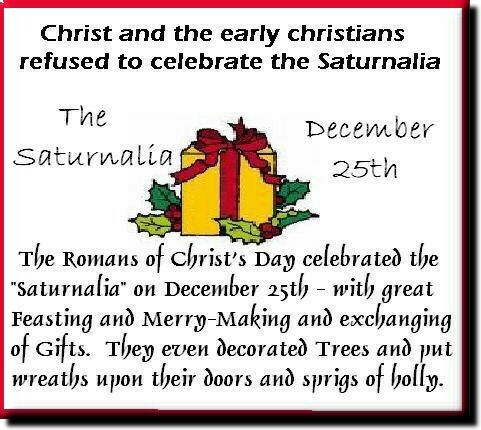 Saturnalia falls at the time when non-Romans are celebrating Christmas, Hanukkah, Winter Solstice. Roman decorations and celebrations Secunda Floria Zonara: Many of the decorations involved greenery - swathes, garlands, wreaths, etc - being hung over doorways and windows, and ornamenting stairs. Ornaments in the trees included sun symbols, stars, and faces of the God Janus. 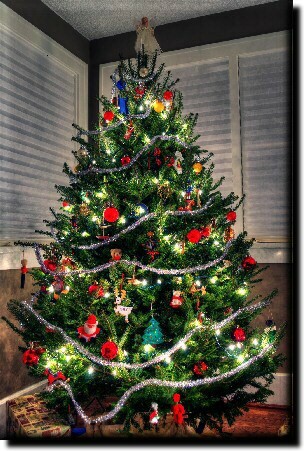 Trees were not brought indoors (the Germans started that tradition), but decorated where they grew. Gold, because the sun is yellow, is always a sure choice for a good Saturnalia decoration. For modern Saturnalia, those golden glass ball ornaments are ideal, as are gold sun faces, gold stars, and gilded anythings. Christmas has no Christian roots but in Roman custom and religion. It was believed that the first Christmas was adapted celebration from the Roman Saturnalia, a type of harvest festival that marked the winter solstice which was the return of the sun and also honored Saturn, which was the god of sowing. Long before the advent of believers, plants and trees that remained green all year had a special meaning for people in the winter. According to the Encyclopedia Americana, 1956 edition, wrote that “Christmas…was not observed in the first centuries of the believer in the assembly. The believer in general was to celebrate the death of remarkable persons rather than their birth. 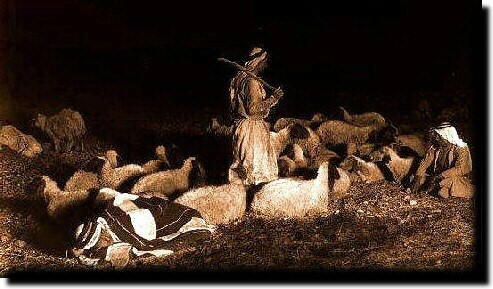 2:8 And there were in the same country shepherds remain in the field, keeping watch over their flock by night. 2:9 And, behold, the Messenger of Adonay came upon them, and the glory of Master shone round about them: and they were sore afraid. Fear not: for, behold, I bring you good news of great joy, which shall be to all people. 2:11 For to you is born this day in the city of David a Moshi'a, which is Mashiach Master. 2:12 And this [shall be] a sign to you; you shall find the babe wrapped in swaddling clothes, lying in a manger. 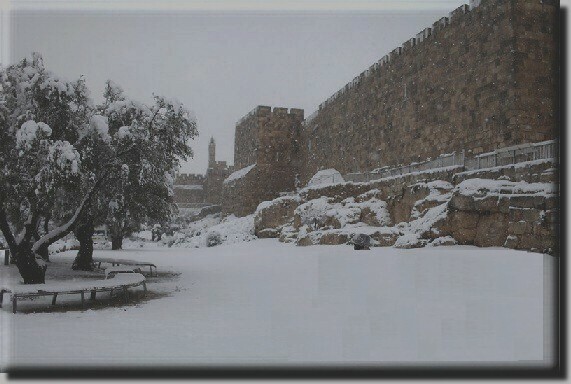 Each Year in the month of December, Israel is always snowing heavily, certainly, there were no sheep in the snowing field. However, the birth of Yeshua, the scripture was never told exactly which month, Many people attempt to speculate. To speculate the month December 25th or to speculate such and such a month, then they are in fact committing in adding words in which the scripture does not tell us Yeshua's date of birth. My advise to believers do not speculate. It is not wise think to do.